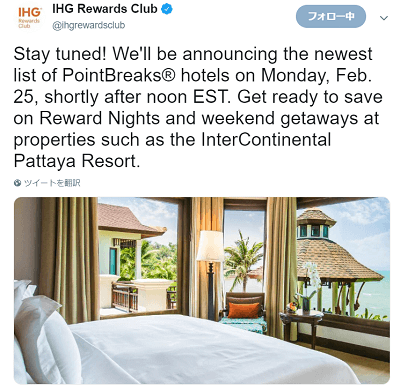 InterContinental Hotels Group, the parent of more than two dozen hotel chains, confirmed this week that it is experimenting with dynamic pricing for its award bookings. The group plans to have the new model in place by the end of the year. Stay tuned! We'll be announcing the newest list of PointBreaks® hotels on Monday, Feb. 25, shortly after noon EST. Get ready to save on Reward Nights and weekend getaways at properties such as theInterContinental Pattaya Resort.